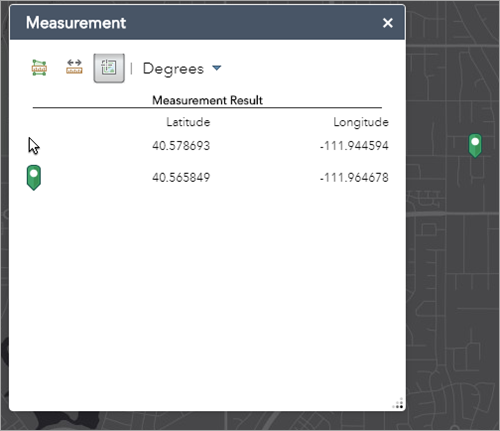 The Measurement widget allows you to measure the area of a polygon or length of a line, or find the coordinates of a point. For the most accurate results, use Web Mercator for the geographic type of spatial references. For other spatial references or complex polygons, a simplification process is applied to address the distortion caused by spatial projections or complicated polygons. You may notice a difference in buffer operation from the Near Me widget. This is because the Near Me widget uses a Euclidean buffer (planar) by default and has an option for a geodesic buffer. The Measurement widget, however, defaults to a geodesic buffer with no other option. The configuration window for this widget appears. 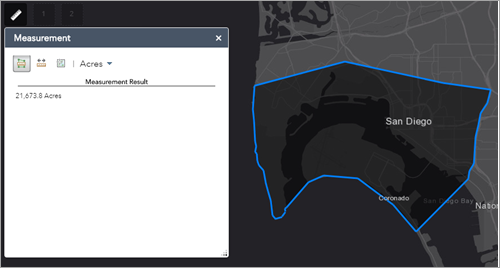 Optionally check the Add the measure graphic as an operational layer of the map check box. This allows you to create your measurements and have the graphic display in the layers window. If this option is not selected, your measurement will display but won't be added to the layers window. Click OK to close the window when you're finished. When measuring an area, distance, or location, you can close the widget or switch to a different widget and your measurements remain. To delete the measurement graphics, open the measurement tool and select Clear. Click the Measurement widget icon to open it. Click the Point measurement button and click a point on the map. The Measurement widget displays the coordinates for the point in degrees (decimal). To change the coordinate display format to degrees/minutes/seconds, change the selection in the Degrees drop-down menu to DMS. Click the Polyline measurement button . Draw a polyline on the map by clicking two or more points. Double-click to finish drawing the polyline. The Measurement widget displays the total length of the polyline using the defined Default Length Unit. 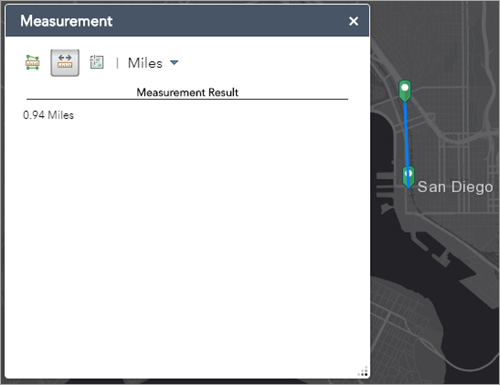 To change the length unit, select the applicable unit of measure from the Miles drop-down menu. Click the Polygon measurement button . Draw a polygon on the map by clicking three or more points. Double-click to finish drawing the polygon. The Measurement widget displays the total area of the polygon using the defined Default Area Unit. 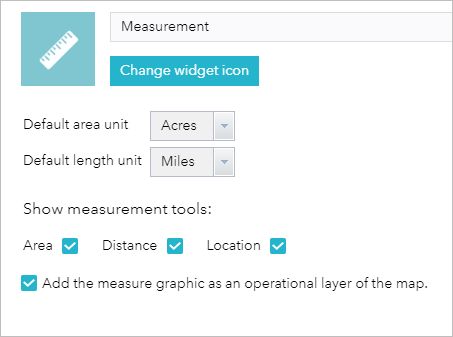 To change the area unit, select the applicable unit of measure from the Acres drop-down menu.